I'm pretty sure that Pele aren't the band I thought they were when I started looking into them, but now I can't remember who I was thinking of. Not that it matters, because they're a great band who released some really cracking jaunty country-fused indie in the early 90s and are a hitherto terrible omission from this place. I now know that, thanks to the official site that's the source of the wiki page and is nicely added to by the ubiquitous myspace page that the band were formed on Merseyside in 1990, gigged around the North West of England, signed a record deal and within a matter of months had released their debut album. Aiming to capitalise on the album, their debut single was released in no time flat and featured on heavy rotation on Radio 1 before record company mistakes robbed them of a proper chart hit. It's ok though, their second single went to number 1 in South Africa. A number of pretty major indie hits followed before some long-winded and painful legal shenanigans with their record company left the band heavily in debt with no rights to their songs until the record company in turn went bust. Phew. Anyway, whoever I was thinking of before setting out on this excursion, I bet they weren't as good (on record or live; when they were apparently fantastic). 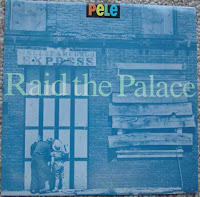 Have a listen to the 'destined-to-not-chart' first release, Pele - Raid The Palace and right from the first bits twangy guitar and fiddle you know you'll be tapping your feet along. Then you'll go back for a few more listens, it's great. 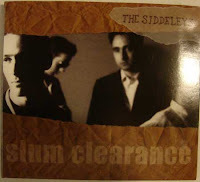 Now I've broken some of my unwritten rules to myself I feel a lot better, not least because it allows me to put The Siddeleys on here; it's a CD again I'm afraid, but try finding some of their vinyl, if you can, you're a better man than I. Besides, hunting down the best of I got this off was enough bloody trouble. The Siddeleys have been floating around my notebook for a while, but it was only reading the excellent Dusty Sevens blog that my hand was forced. So, in essence, formed in 1986, released their debut single "What Went Wrong This Time?" in 1987, replaced the drummer with Dean Legget out of...wait for it, wait for it... pre-Carter USM funsters Jamie Wednesday! (amazing how often these bands get a link back to Carter), recorded a Peel Session and then got stiffed by their record label going bust before they could release much more. In 2001 or 2002 a compilation called Slum Clearance was released and this is where today's featured track comes from. You can read more at the rarely updated but excellent 'official' site, or at Indie MP3 or the Wiki page, that I swear wasn't there when I first looked into the band several months ago. I can heartily recommend this song, The Siddeleys - Sunshine Thuggery, it's a belting bit of indie pop with a really catchy tune, try listening a couple of times without humming along. I'm normally pretty dedicated when it comes to hunting something down, but for some reason this one broke me. I finally got hold of the CD from Rough Trade, now I've listened to it a few times, I'd suggest you do too, it's marvellous. Following in the great "you can't be indie unless your band name has a 'The' at the start..." theme of recent times, it's The Moonflowers today; proudly ploughing the same furrow as Flowered Up and knocking out some of that old fashioned trippy indie that was oh so popular in the early 90s. "Formed in December 1987 for a few parties: [the band] made records until 1997...Following the success of indie hit 'Get Higher' in 1990, they were transported to a national, then international platform beseeching their audience and followers to hold hands while they watched the group cavort and leap about in an effort to obtain world peace by the year 1999." Unfortunately The Moonflowers are another of the bands (like The Chesterfields and Lush) who have an ex-member who died early; in this case drummer Toby Pascoe who died aged 32. Well, on that cheery note, here's The Moonflowers - Fire; try not to hum Weeee-kender as you're listening. 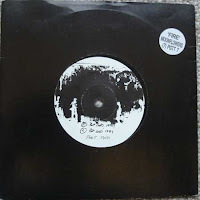 Just a note as well, the 7" this is copied off doesn't appear to be on their "official" discography, it certainly looks kind of promo, maybe my reader can offer some sort of extra information? To London now with sadly short-lived twangy/jingly-jangly The Corn Dollies. You'll like this lot, they're fantastic and produce really top notch singalong music that's absolutely the sort of stuff I was thinking of when I start this madness 18 months ago. There's a good little biog/discography here and tweenet and wikipedia have the usual. Unfortunately as Wilfully Obscure points out, there's not a lot else kicking around about the band, which seems a shame as from what I can hear they were great. Sadly I guess you can add them to the ever-growing list of indie bands that were killed by grunge. 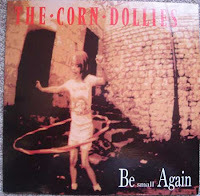 I don't know why but this song, The Corn Dollies - Be Small Again reminds me of Billy Bragg for some reason, I think the opening twangy-singy bits sounds a but like Accident Waiting to Happen, or maybe that's just me. Apologies for lack of updates recently, I'm building up to a solid few weeks off and need to get my house in order (literally and metaphorically). In the meantime, let's get back on the horse with The Wendys. As usual, pop over to the wiki page for a bit more information, but this time we're celebrating not only a great Scottish band, but a gen-u-ine, honest-to-goodness, Factory Records white label as you can see in the picture at the top. "The Wendys are the first band to sign to Factory since northside and also share the same producer...Ian Broudie." The insert also claims, oddly, that this is the band's first release on the label, but as you'll see in the linked Wiki article it's actually their second, although this rather detailed page seems to imply that their "first" EP entitled "More Than Enough" never got a proper release; maybe my reader can help fill in the blanks? There's some great stuff kicking about the internet about the band, all of which is worth a read; an NME clipping and of course a myspace page (I should really be collecting all these; if only I wasn't such a bloody luddite and understood myspace). 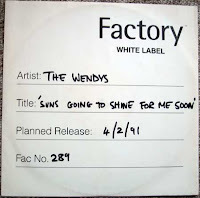 Well, enjoy this: The Wendys - The Sun's Going to Shine for Me Soon, it's a cracking bit of indie pop and far better than Northside any day.